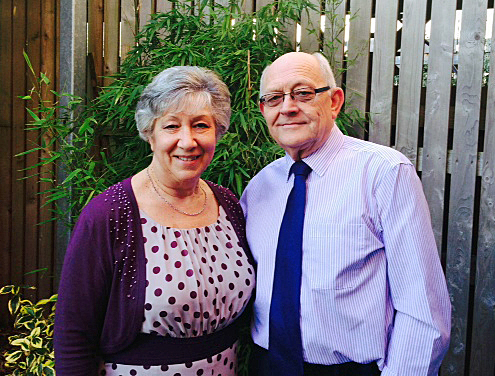 Hazel & Paul are amateur dancers who dance purely for enjoyment. In 1991 we started learning ballroom and latin at the Goodyear School of dancing in Bath and came across Old Time Dancing, when we started attending local dances and saw some lovely dances that were danced in sequence. Having made some enquires we heard about a teacher who was starting a class. In 1993 we walked into the first class with Sue and Les Kellie and have not looked back since. We both enjoyed the dancing, Sue and Les were very patient with us as we got to grips with the dances. After a few months it was suggested that the class might like to attend an Old Time dance that was being held the following Saturday. What a wonderful time we had at that first dance, the Bryan Smith Trio was playing and there were over 125 attending the dance. We started to dance more and more Old Time and Sue Kellie continued to help and support us and we attended her Old Time Dance club. We joined The Old Time Dance Society in 1994 and have been continuous members ever since. However, because we had a young family we could only attend the occasional Old Time Dance Society Ball of the Year when it was near enough to travel for the evening. Our first full Old Time Dance Society event was the AGM at Rochdale and now we attend all the events, some dancing holidays and dance most weekends even though this often involves a lot of travelling. What we did not know when we started dancing Old Time was that it would give us a wonderful social life, very dear friends and most of all fun.